I do hope you are all having a splendid week? Dennis and I have been working so hard on the website for the past months, that when we launched it on 01.01.2016, everything came all at once...a big bombardment of features! Now the Library was something that I wanted to do for a very long time. 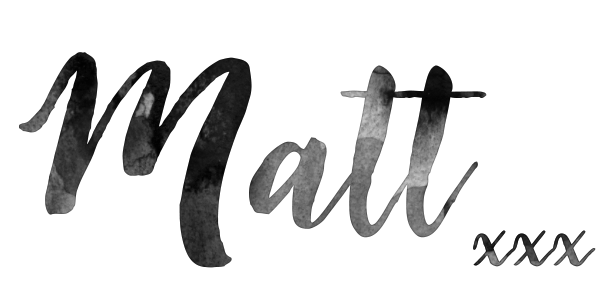 I initially started working on this about two years ago with my old blog According to Matt. The library took a lot of time to put together and after various other commitments took greater priority, it soon fell by the wayside. It wasn't until Dennis and I both started working on Boys & Bunting, that we realised with a little more dedication and focus, we could really make the Crochet Library work. That's what we did... Dedication and focus, to bring you a Crochet Library that we are both extremely proud of! We tried our best to make the library as user friendly as possible, so we've set up the homepage with a layout, similar to that of all the other Library pages. 1. 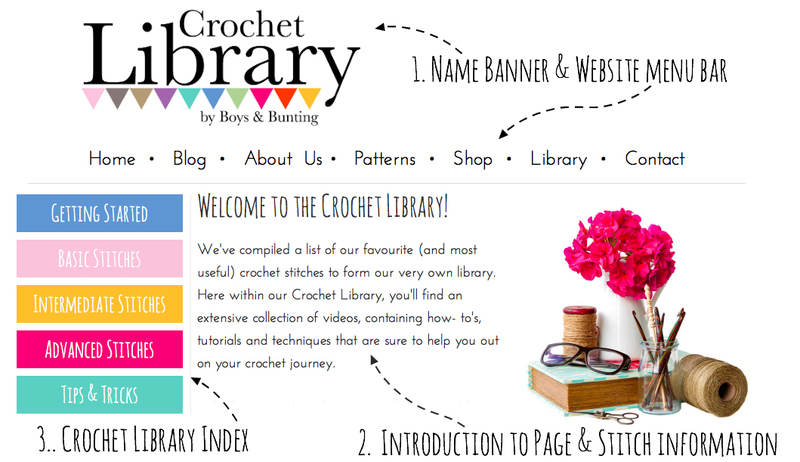 The Crochet Library name banner and website menu bar - This simply lets you know that you are in the library section of our website and the menu bar has the same categories as our regular webpage. 2. An introduction to the page - Giving you all of the information that you will find about the topic/stitch featured on this page. 3. The crochet Library Index - Here you'll find all of our stitches and tips split up into levels based upon difficulty. 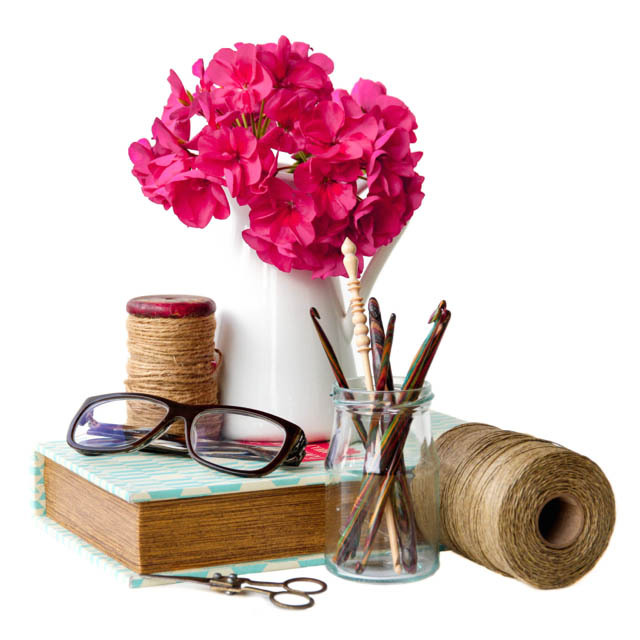 GETTING STARTED - Here we cover everything that you'll need to start off crocheting; From the equipment that you'll need, all the way up to how to hold your hook and tension your yarn. BASIC STITCHES - All of the basic crochet stitches that you'll need to know. We cover the Single Crochet, Double Crochet, all the way up to a Simple Granny Square. INTERMEDIATE STITCHES - Some slightly trickier stitches and techniques, but still easily explained and more than do-able. ADVANCED STITCHES - Some stitches that require a little bit of crochet knowledge. Don't be put off by the name though as these stitches are in no way as scary as they sound! TIPS & TRICKS - A category containing some extra resources that we thought would be useful to help you with your crocheting. These categories will definitely be something that we expand over time, so please keep popping back to see if there are some new stitches that you would like to try your hand at. Once you've found what your looking for in our library index, simply click on the link and you'll be taken to the page of that stitch or technique. What will you find on our Stitch Pages? 1. Information about the stitch - Here we give you a little overview of the stitch; some information about its name and its abbreviation, some details of the type of stitch produced and also a picture of this stitch, so you can see what it will look like when worked up. 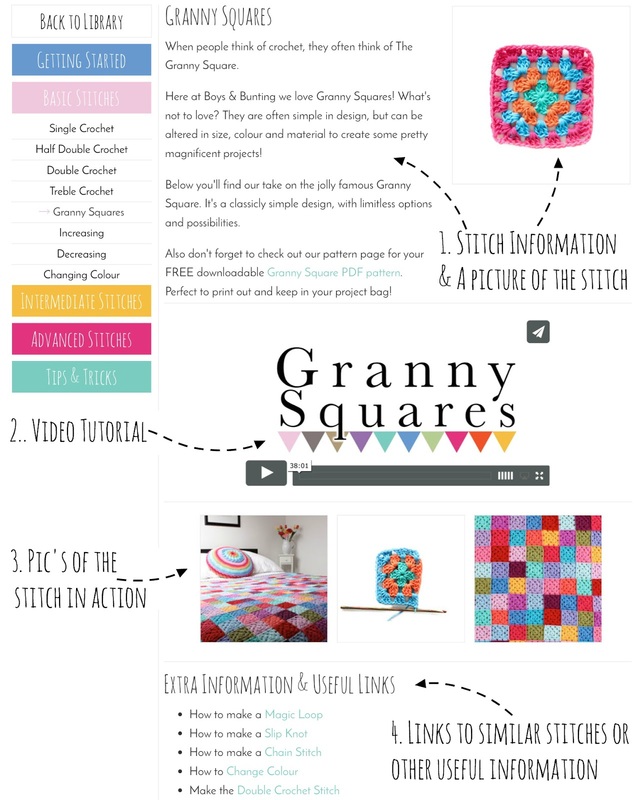 2. video tutorial - This is really the gem of our Crochet Library. We've taken a lot of pride into making videos that are easy to follow and full of information. Videos that will surely help you out when recreating the featured stitches. Our videos can be found on our YouTube channel. Here you'll find all of our Crochet Library videos, plus extra snippets of our daily shenanigans. 3. Pictures of the stitch in action - Here we give you some examples of the stitch being used in a project. Not only is it great to see what sort of uses the stitches have, but also to inspire your future projects. 4. Extra information and useful links - Finally... If stitch descriptions, video tutorials and photographs of the stitches weren't enough, then we also have some links to similar stitches or handy references that may be of use to you. Puh!!!! That was a lot of explaining, but well worth it! As you probably can tell both Dennis and I are super excited about the feature of our Crochet Library. and are very pleased to be sharing it with all of you! If you have any requests for tutorials that you would like to see appear on our library then please let us know. Love the new website guys! Great website, very nicely laid out!! I like how user friendly it is!!! Congratulations and best wishes on your new endeavours!! Hey Joan, We received your private email also, but for some reason the mail wouldn't deliver...In answer to your question: We are in the process of adding a newsletter sign up feature to the blog. It should on the website by the end of the month, so stay tuned! LOVE the new site - the name, the design, the concept - fantastic! I already know that B & B will be my go-to crochet spot. Congratulations!